Pope Francis shared the story of an angry phone call he received from German Chancellor Angela Merkel after he compared Europe to “barren woman” that can’t have children. The comment may have hit close to home for Merkel, who is childless herself and runs a country where the birthrate has dropped by almost one child per woman over the past 55 years. 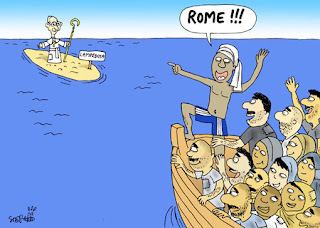 Francis calmed Merkel down by saying there is still hope for the continent. 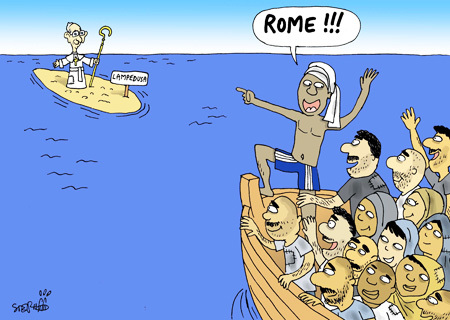 Of course, the Pope's Hope is landing on Lampedusa, and he is there to greet it. The story goes on to say that Merkel doesn't remember that phone call with Pope Lenin. Sheesh - not only barren, but senile too.